After years of poaching, vandalism and general visitor abuse, the U.S. Government intervened in Yellowstone's affairs and the U.S. Cavalry was called in. In 1886 the Army arrived and established a temporary tent camp. 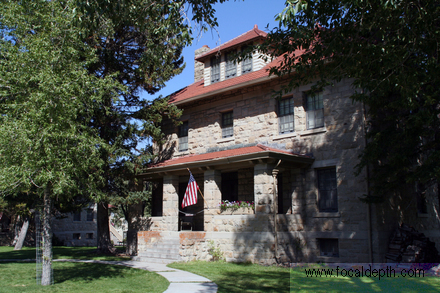 Five years later, the Army decided it would be maintaining a presence in Yellowstone for some time and erected the first permanent building.Construction began with clapboard buildings in 1891 and expanded to rows of red roofed stone buildings in 1909 (they are beautiful). At one time this military post housed over 400 men. When the National Park Service assumed park managemnt duties in 1918, the fort became their headquarters. All of the buildings at Mammoth are built on an old terrace formation known as Hotel Terrace and some places have been eaten away by acidic water. Several large sink holes can be seen on what used to be Fort Yellowstone parade ground.